apollis - Institute for Social Research and Opinion Polling is a general partnership based in the heart of Bolzano/Bozen on Dominikanerplatz 35. Here are our offices, conference room, and our telephone laboratory. You can contact us during office hours (9 a.m.-1 p.m. and 3 p.m.–5 p.m.). The institute is registered in the Register of Companies, No. 172302. Bank: Raiffeisenkasse Bozen ABI 08081 CAB 11600 K/K 03/00/00.617-3. By train: Bolzano/ Bozen is situated along the Brennero/Brenner railway line and can be easily reached from Germany via Munich and Innsbruck or from Italy via Verona - Trento. By car: Bolzano/ Bozen lies along the Brennero/Brenner motorway (A22) and can be reached from the North via Munich – Innsbruck – Brennero/ Brenner or from the South via Modena - Verona - Trento. 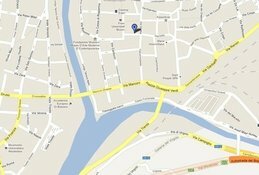 On foot: We are located in the centre of Bolzano/Bozen within a 5 minute walking distance from the Bolzano train station. Follow the “Bahnhofsallee” which leads from the train station to the main square (“Waltherplatz”). Take the street on the left of the square and carry on until “Dominikanerplatz”. Our institute is on the 3rd floor of house no.35. Parking: There is a parking garage next to the train station (P1) and one on the main square (“Waltherplatz”), (P2). The parking garage Bozen Zentrum (P3) is easier to reach, cheaper, and lies at a 10 minute walking distance from our institute. See guidance system.